The controversy pertaining to Bangladeshis’ illegal entry to Assam has come back to the Supreme Court again, which had struck down the Illegal Migrants (Determination by Tribunal) (IMDT) Act, with two leaders from the state challenging the amendment in the Foreigners Act. The Election Commission (EC) today procured the CD of Prime Minister Manmohan Singh’s speech at Dongkamokam of Karbi Anglong, where he allegedly announced an economic package violating the model code of conduct. Senior MEA official Rakesh Kumar, who is accused of having involved in human trafficking by the CBI, is understood to have got himself admitted to a hospital in Munich in Germany. An NDA delegation today met the Election Commission and urged that all voting booths in West Bengal, where the first phase of Assembly elections are scheduled for April 17, be guarded by Central forces. Former Prime Minister Atal Bihari Vajpayee today put the lid on the media controversy by deciding to bless Leader of the Opposition L.K. Advani and BJP president Rajnath Singh who are undertaking the twin yatras from April 6. Each of the 8.5 crore population of Bihar owes a debt of Rs 5,180, which has accumulated during the 1-year RJD rule. Presenting the first-ever White Paper on the state’s economy in the Assembly yesterday, the Deputy Chief Minister and in charge of the Finance portfolio Mr Sushil Modi said as on date, the total debt of Bihar stood at Rs 42,483 crore. The state Home Department has reportedly taken a serious note of the incident where a notorious criminal gang from Bihar had attacked a prominent businessman in Nepal, Mr Ramesh Kedia, on Friday after he refused to pay money to them. Tamil Nadu Chief Minister J. Jayalalithaa has hit the road with her election campaign much before her opponent Dravida Munnetra Kazhagam (DMK) and is drawing large number of crowds through her populist measures. The Budget session of Parliament, which was adjourned in the midst of a controversy over the office-of-profit issue, will resume on May 10. The second part of the seventh session of the House will commence on May 10 and is likely to conclude on May 23. To ensure foolproof security to the prestigious Delhi Metro Rail project, the Centre yesterday decided to have a separate single dedicated security force for it. The force will be modelled along the lines of the elite commando force, National Security Guards (NSG) and Special Protection Group (SPG), which guards the Prime Minister. Bhubaneswar, April 4 After 11 days of confinement in deep jungles, two police officials abducted by armed Maoists from Ramagiri Udayagiri town of Orissa’s Gajapati district on March 24 were released in a dramatic fashion today. After giving a clean chit to the organisers of the Lakme Fashion Week, which was plagued by wardrobe malfunctions of participating models, the Mumbai police has trained its guns on photographers who snapped the offending visuals. Finally there is light at the end of the dark tunnel for 16-year-old physically challenged student Parbati Kumari from Saran district. The Saran District Magistrate, Mr Amarendra Narayan Singh, has assured all possible help from the administration to fulfil her dream to become a teacher. The All-India Democratic Women’s Association (AIDWA) has demanded the immediate release of the president of the Kerala state Students Federation of India, Sindhu Joy, who is also contesting against Chief Minister Oomen Chandy in the forthcoming elections in the state. A member of the Lok Sabha, Mr Ramdas Athawale, has written a letter to Prime Minister Manmohan Singh on the ‘illogical’ role being played by the Directorate General of Civil Aviation (DGCA). A World Bank report yesterday said that India’s forests had great potential for poverty reduction and with greater community control over their management, income from forest produce could rise to $ 2 billion per annum in 2020. In a determined bid to provide a greater impetus to Indo-US relations, several American Congressmen and senior officials are visiting India starting with Assistant Secretary of State Richard Boucher on Thursday. Afghanistan President Hamid Karzai is arriving here on April 9 on a week-long visit to this country for discussions with Prime Minister Manmohan Singh and other leaders on a whole range of bilateral, regional and international issues as well as the restoration of democracy in Afghanistan. A senior Army officer has filed a petition in the Calcutta High Court claiming that he was denied promotion to the post of Lt General owing to change in promotion rules by the erstwhile NDA government at the Centre. Festival of tribesmen in Bhubaneshwar. Banaras: A Mystic Love Story is of a different genre. The controversy pertaining to Bangladeshis’ illegal entry to Assam has come back to the Supreme Court again, which had struck down the Illegal Migrants (Determination by Tribunal) (IMDT) Act, with two leaders from the state challenging the amendment in the Foreigners Act. They have accused the Centre of bringing the IMDT from the back door to circumvent the court ruling. A Bench of Mr Justice S.B. Sinha and Mr Justice P.K. Balasubramanyan while taking cognisance of the petitions of Asom Gana Parishad MP Sarbananda Sonowal and local BJP leader Charan Chandra Deka yesterday issued notices to the Centre and Assam Government, seeking their replies. The notice was also issued to Attorney-General Milon Banerjee for assisting the court in deciding the matter. The apex court had on July 12 last year struck down the IMDT, holding it as unconstitutional and instrumental in encouraging the entry of illegal migrants from Bangladesh to Assam due to impracticable methodology of their detection. But the UPA government had made drastic changes in the Foreigners Act after the IMDT was struck down and under the amended provisions, the onus of proof of an illegal migrant from Bangladesh had been cast upon the person, who lodged a complaint about his presence in the state. The petitioner said by putting the onus on the complainant, who brought the matter before a Foreigners Tribunal, had in fact brought the IMDT back. Challenging the constitutional validity of such a law, they said even under the evidence, the burden of proof always rested with the person against whom the complaint was made and not on the complainant. The BJP had lodged a complaint in this regard and the Prime Minister’s office as well as the Congress had denied that any such economic package was announced. According to sources, Rakesh Kumar, Special Secretary for Economic Relations in the Ministry of External Affairs (MEA), had complained of chest pain and high blood pressure while on his way back here from an official tour to Brazil where he had gone last week with the Minister of State for External Affairs Anand Sharma. He broke his journey in Munich and got himself admitted in a hospital, sources said. As per the CBI case, Rakesh Kumar is accused of facilitating the entry of nine illegal immigrants under the cover of dance troupe to Germany, when he was the Director General of the Indian Council of Cultural Relations (ICCR). Meanwhile, the External Affairs Ministry said it was waiting for the probe to 'take its course'. "All I can say at the moment is that he has proceeded on leave and we will wait for the investigations to take their course," MEA spokesperson Navtej Sarna told newspersons when asked about the issue concerning Rakesh Kumar. Asked about his whereabouts, Mr Sarna maintained that he was not aware of details. The CBI has already arrested a person in connection with the alleged human trafficking case. Shiv Kumar Sharma was arrested by the CBI on March 31, two days after raids were conducted at several places, including the residence of Rakesh Kumar, the 1972 batch IFS officer. BJP general secretary Arun Jaitley, the party’s poll manager for West Bengal, expressed NDA’s apprehension that the ruling CPM could rig the elections if the state police was used to guard booths. “The entire voting booth management should be handed over to the Central forces for fair polling as we apprehend the ruling CPM may try to rig elections if the state police was deployed,” Mr Jaitley told reporters. He said the Opposition alliance also sought compulsory use of photo-identification cards for voting. BJP vice-president Mukhtar Abbas Naqvi, Trinamool leaders Dinesh Trivedi and Mukul Roy, and Mr Digvijay Singh accompanied Mr Jaitley to the Election Commission. 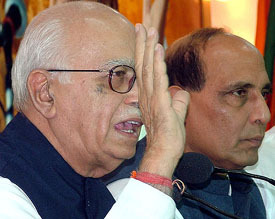 “The day the Congress honestly accepts that ‘communalisation of domestic policy’ is not in India’s national interest and reverses its politics of minorityism, a firm foundation will have been laid for the BJP and the Congress to make a common cause in a very wide area of politics and governance,” Mr Advani said here at a joint press conference with party president Rajnath Singh ahead of their “suraksha yatras” from Rajkot and Bhubaneswar, respectively, on April 6. This statement assumes great significance as it comes a couple of months after senior RSS leader M. G. Vaidya’s article in a newspaper suggesting that the Congress and the BJP should come together in the national interest. Criticising the UPA’s “appeasement policy”, stating that it may lead to another division of the country, he said the BJP was firmly against the notion of majority and minority gaining roots in the political system of India. “This divisive mindset jeopardises India as one united, integral and harmonious nation,” Mr Advani said. Referring to Congress president Sonia Gandhi’s signed article in the official organ of the Congress party in which she had stated that “some political parties are trying to communalise foreign policy for short term electoral gains...we do not think that religion can or should be the matrix for national interest in a country as linguistically and religiously pluralistic as India,” Mr Advani said, “I fully agree with her... No Indian can disagree with this view. At the same time we urge the Congress president and her party to introspect on whether it is wrong to communalise India’s foreign policy but right to communalise India’s domestic policy,” he said. He also had a dig at Justice U. C. Bannerjee, who headed the high-level committee constituted by the Railways, which concluded that the Godhra train blaze was “accidental”. Mr Vajpayee will bless the two yatra-bound leaders here tomorrow at his Krishna Menon Marg residence. Meanwhile, Mr Advani dismissed the report in a national daily that Mr Vajpayee advised him against undertaking the twin “Suraksha Yatras”. “Mr Vajpayee is very enthusiastic about the twin yatras to be undertaken by me and Rajnathji,” Mr Advani said, when his attention was drawn to a newspaper report which quoted Mr Vajpayee as having told him that it was very inopportune to go on such yatras now. “It is amazing was the reaction of Mr Vajpayee when I spoke to him today about the report,” the former Deputy Prime Minister said. Mr Advani said the yatras enjoyed the support of all Sangh Parivar units as they were meant to “educate people about the dangers of the appeasement policy being pursued by the UPA government”. He claimed that the objective of presenting the White Paper was not to blame anyone, but to work out guidelines by taking a lesson from the prevailing financial mess in order to bring out the state from the debt trap. According to him, when the RJD took over in 1990, the state had a debt of Rs 10,501 crore. He also expressed concern over the huge loss of about Rs 107 crore every month being incurred by the Bihar State Electricity Board (NSEB). Against Rs 4,800 crore development fund utilised by the present NDA in the past four months, the previous regime could not use Rs 8,000 crore of Central funds because of its inability to prepare project reports to utilise the funds. It was further pointed out that against the 5.4 per cent national growth rate in the past decade, Bihar had registered a growth rate of just 3.6 per cent. Claiming that it was an uphill task before the new government to bring back the state’s economy on the growth track, Mr Modi regretted the lack of development in the field of infrastructure in the past 15 years. The opposition RJD staged a walkout from the Assembly during the presentation of the White Paper, alleging that the matter was not referred to the Business Advisory Committee before presenting it in the house. Owner of Kedia group of industries was injured when his car was attacked near the industrial city at Birgunj in Southern Nepal. The criminal gang reportedly demanded Rs 50 lakh in Nepal currency from Mr Kedia. The gang was from Gopalganj area. Sources in the Home Department said the attack on Mr Kedia only substatiated the intelligence reports received by the governments of Nepal and Bihar that gangs from Bihar and Uttar Pradesh had been carrying out kidnapping and extortion of businessmen in the border areas by taking advatnage of the porous border between the two countries. Sources admitted that Indian gangs were also using Nepali soil to detain victims of abduction in hideouts until the search for them in India died down or relative paid the ransom. The main plank of her campaign is that Tamil Nadu has 13 ministers in the Union Cabinet who have not delivered results during the past one year while she has many laurels to her credit. While campaigning yesterday in Cuddalore district in northern Tamil Nadu, which was devastated by tsunami, she said her government gave adequate relief for the tsunami-affected and also those hit by the floods. She asked the people to support the All-India Anna Dravida Munnetra Kazhagam (AIADMK) and its allies for continuing the “golden era” in the state. Ms Jayalalithaa said her government not only maintained good law and order in the state but also managed to attract unprecedented FDI to the state. The AIADMK supremo launched a virulent attack on the Centre for raising prices of essential commodities and accused the central ministers from the state of “blocking” all schemes of her government. The major thrust of her campaign was “the achievements” of her five-year rule and a stinging criticism of the Centre. Pointing out that the state experienced four continuous years of drought, floods last year and a devastating tsunami in 2004, she said she had provided relief to all people affected by the natural calamities. Surprisingly, the dates for the second part of the session are exactly the same that were decided even before the start of the Budget session in February in view of the Assembly elections which would be completed by May 8. The sine die adjournment of both Houses last month had resulted in Opposition’s suspicion that the government was planning to promulgate an ordinance on the office-of-profit issue to save Congress president Sonia Gandhi from “imminent disqualification”. However, Mrs Gandhi’s resignation from the Lok Sabha defused a political storm that was developing. After that Parliamentary Affairs Minister Priya Ranjan Dasmunsi held discussions with leaders of Opposition and allied parties and a consensus was reached, a legislation would be brought forward to amend the law exempting more posts from the definition of office of profit. A decision to this effect was taken at a meeting chaired by Union Home Minister Shivraj Patil and attended among others by Union Home Secretary V.K. Duggal, Delhi Metro Rail Corporation Ltd (DMRC) Chairman E. Sreedharan, senior officials of the Ministry of Home Affairs and Urban Development, Director-General CISF S.I.S. Ahmed and Commissioner of Police K.K. Paul. This force will be equipped with modern gadgets and would be trained in anti-sabotage and anti-terrorist operations sources said, adding that as part of the three-layered security plan, 3,000 personnel would be engaged. The force is likely to be headed by a DIG and assisted by a Commandant and three Deputy Commandants, besides other subordinate staff. The Centre, however, is yet to make up its mind on whether this force will be directly under the Centre or with the Delhi Government. “The modalities in this regard have not yet been finalised...but will be decided upon soon,” a source said adding that the Union Home Secretary would review the security plan and other related issues again in two weeks. The bomb blasts in the London underground train network last year, which killed a large number of people, was one of the factors that shaped the government’s security plan. Delhi was porous and there was a huge floating population which heightened the threat perception here. The security plan had been prepared by the CISF with the main focus on preventing smuggling of explosives by anti-national elements. After 11 days of confinement in deep jungles, two police officials abducted by armed Maoists from Ramagiri Udayagiri town of Orissa’s Gajapati district on March 24 were released in a dramatic fashion today. Superintendent of R. Udayagiri sub-jail Rabinarayan Sethi and officer in charge of the local police station Ranjan Kumar Mallick were handed over to a media team at an undisclosed place in the district, reports available here said. When contacted, Gajapati district collector Binod Bihari Mohanty said the two freed policemen had been set free somewhere near Adaba. They were being taken to Ramagiri Udayagiri town, he added. Both the released men were in good health and looking forward to rejoining their family members, the reports said. None of the demands had so far been fulfilled by the government. Among other demands of the Naxals were a halt to alleged plundering of natural resources in the name of industrial development and displacing people to set up industrial units. The Social Service Branch of the Mumbai police is on the lookout for mediapersons and members of the audience at the fashion week who may have shot the embarassing pictures of the clothes falling off the models. “Those who shot the pictures and are circulating these on the mobile phone networks may be prosecuted under obscenity laws,” Deputy Chief Minister R.R. Patil said here. While television channels are repeatedly telecasting the video with visuals smudged at the appropriate spots, the unedited versions are on the Internet and circulated as MMS clips on mobile phones. Today, the Mumbai police has given the organisers of the fashion week and the models a clean chit. It says they are convinced that there was nothing deliberate in the incidents. 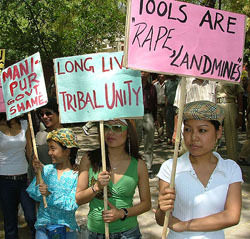 The incidents were discussed in the state Assembly with several women members demanding a probe. On the spotlight are models Carol Gracias whose top fell off while she walked on the ramp and Gauhar Khan whose skirt split open revealing her posterior. The reason being that she has overcome her physical handicap, perhaps like no one else in the state. Parbati truly symbolises that where there is a will, there is a way. And as she not only writes her examination papers with her right foot, but also eats and combs her hair in the same manner. Parbati, daughter of a poor farmer, Bhagaban Mahato, was born with congenital abnormalities of the upper limbs, which are not fully developed. Ironinally, in view of the social stigma attached to the disease and that too in rural Bihar, her parents not only neglected her but also wished her death. But this did not deter Parbati. Her determination and courage did not allow this physical disability to come in the way of her willingness to live life to the full. She not only enrolled herself in school but completed her matriculation in 2004. Confident, she then got herself admitted to the intermediate course at H.R. College and recently appeared for the arts examination 2006. The superintendent of examination, Mr Rabindra Prasad, was impressed all more with Parbati’s refusal to accept a separate seat & take examination in accordance with the seating arrangements. “I do admire her self-respect and determination,” Mr Prasad said. When the matter was brought to the notice of District Magistrate Amarendra Narayan Singh, he was prompt to respond to the request to extend all possible help to fulfil her dream to become a teacher. Mr A.N. Singh said,“Parbati will enocurage many other physically handicapped students to emulate her to overcome the challenges of life”. Joy, who is the LDF candidate against Mr Chandy, it is alleged is being victimised. In a statement issued here Subhashini Ali, president of AIDWA and general secretry Sudha Sundaraman said coming a few days before she was to file her nominations, it is only too apparent that her arrest has everything to do with the Chief Minister’s concern about reinstating his seat and nothing to do with the rule of law. It was pointed out that Joy has been at the forefront of struggles against the privatisation of education and has been a victim of police brutality. The AIDWA said it was shocking that Joy was being treated as a criminal and was even being denied using the toilet. They alleged that all this was being carried out at the behest of the government. The letter has a specific stress on the regulations imposed on pilots resigning from one airline and joining another. In the letter written yesterday, Mr Athawale pointed out that the regulations issued by the DGCA defy logic. Referring to the mandatory six-month notice period in the case of pilots resigning from an airline, the Member of Parliament said in the public interest, these regulations need to be lifted. Pointing at the recent case of senior specialists from AIIMS joining other organisations, Mr Athawale said in the economy driven by market, it was rather regressive that pilots in both the public sector and private sector were being harassed by the DGCA with a regulation of mandatory six-month notice period. On the issue of illegal training of the B-777 instructors of Air India, he alleged in his letter that V. Thulasidas and M.K. Hathi were pressurising the DGCA to grant approval to the “illegal training by violating its regulations”. The estimated increase in income from forests could result from the current community-based Joint Forest Management(JFM) programme that covers 27 per cent of the country’s total forest area, encompassing 85,000 village communities, the report titled “India: Unlocking Opportunities for Forest-Dependent People” said. The report released to the Press here yesterday, while lauding the JFM concept also pointed out some shortcomings to be removed to make the initiative yield better results. It said the JFM model at present weighed in favour of state forest department’s control over planning management, investment, harvesting and marketing. Mr Boucher heads the State Department's newly created Bureau for South and Central Asia and will be here for three days for meeting with his Indian counterpart S Jaishankar, Joint Secretary (Americas) in the External Affairs Ministry. The rapid fire visits assumes significance after Foreign Secretary Shyam Saran's breezy trip to Washington last week to enlarge areas of cooperation, including in the civilian nuclear field identified in the March 2 joint statement issued during the visit of US President George W. Bush. Mr Boucher's trip will be followed by Senator Chuck Hagel, senior Republican Senator and member of the Senate Committee on Foreign Relations, Speaker of the House of Representatives Dennis Hastert and a Congressional delegation led by Senator Michael Enzi accompanied by the US Education Secretary Margaret Spellings along with Democrat Senator Edward Kennedy. Senator Hagel will be in the country from April 9. The two leaders will review the progress made in the reconstruction and developmental projects being implemented by India in Afghanistan. India has several developmental and reconstruction works under way in Afghanistan encompassing health, infrastructure and education. Mr Karzai is expected to brief Dr Singh about the latest developments in Afghanistan. In his petition, General Officer Commanding, Bengal Area, Maj-Gen Arun Roye alleged that he had been denied promotion to the position of Lt General illegally by changing the rules and criteria for such promotion. During the last hearing before Mr Justice Pranab Chattopadhyay, his Saktinath Mukherjee claimed that the denial of promotion to the Major General was a “conspiracy” and due to that promotion rules had been changed. The next hearing is scheduled to be held on April 6.